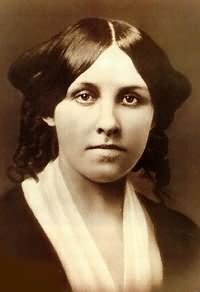 Louisa May Alcott, naixita de Germantown (Philadelphia, Pennsilvania) o 29 de noviembre de 1832 y muerta en Boston (Massachusetts) o 6 de marzo de 1888, estió una escritora estatounitense. Amás conoixita d'as suyas obras ye a novela Little Women, amás d'atras obras de Literatura chovenil. En os alazetz d'a suya carrera literaria, escrebió novela negra gotica con o seudonimo d'A. M. Barnard. 1866: Behind a mask: or a woman's power. 1867: Morning-Glories and Other Stories. 1867: The Mysterious Key and What It Opened. 1870: An Old Fashioned Girl. 1871: Little Men: Life at Plumfield with Jo's Boys. 1872: Work: A Story of Experience. 1875: Eight Cousins or The Aunt-Hill. 1875: Beginning Again, Being a Continuation of Work. 1876: Silver Pitchers, and Independence: "A Centennial Love Story". 1876: Rose in Bloom: A Sequel to Eight Cousins. 1880: Jack and Jill: A Village Story. 1886: Jo's Boys and How They Turned Out: A Sequel to "Little Men". 1888: A Garland for Girls. Se veigan as imáchens de Commons sobre Louisa May Alcott. Zaguera edición d'ista pachina o 8 mar 2013 a las 19:03.